INTERVIEWS CARL TANDATNICK AN ARTIST AND ANESTHESIOLOGIST EXPLORES THE ISSUES OF AIDS IN PAINTING AND INSTALLATION Carl Tandatnick is both a practicing physician and visual artist. His most recent work has been the subject of AIDS and like a number of artists today, he too is attempting to present his art as agitprop to get people to take notice and make an effort to do something about this epidemic. Tandatnick's paintings are monumental canvases with photo-silkscreened images of true microscopic cells repeated within the composition. In USAIDS (1994), 12 feet by 10 feet, for example, the red outer band shows the actual AIDS virus attacking white blood cells magnified thousands of times by an electron microscope. The small white band shows non-infected white and red blood cells under less magnification. The blue center shows skulls which are meant to be symbolic of the AIDS virus's death knell. On December 1, 1994, the artist was invited to participate in A Day Without Art by presenting one of his paintings on the SONY Billboard in Times Square. Superimposed on the image was "Today is Day Without Art...When is Day Without AIDS." Tandatnick's painting was included in "Don’t Leave Me This Way. Art in the Age of AIDS,” an exhibition on view in 1994 and 1995 that included the work of more than 100 international artists at the National gallery of Australia in Canberra. His work recently became part of their permanent collection. LIFE CRISIS 1994, an installation which is a replica of an operating room where viewers who want to enter the space must wear an operating mask and enter the room through steel doors. The room is filled with 108 glowing IV bags that fluoresce a variety of colors. Each color represents different stages of life and death. Alongside the IV tubes mirrored chairs reflect the viewers and serve as a metaphor for the crises we may experience in our own lives. At the far end of the room is an operating table with what seems to be an anesthetized patient covered by blue operating blankets. Here the patient is flanked by an electrocardiogram and an aesthesia machine with ventilators that switch on and off. There is a soundtrack that accompanies the installation where the viewers hear the sounds of doctor’s voices, medical equipment, sirens and the sounds of patients, a baby, a young woman and an old man. Sounds of nature such as wind, fire and rain, three of the four basic elements of the universe, can be heard as well. This installation was presented at the Alternative Museum in New York City in 1994 and is on exhibit currently until October 15, 1995 at the Artspace Gallery of the University of Virginia in Charlottesville, Virginia. I had the opportunity to interview the artist to learn more about his background and his dual careers. LESLIE AVA SHAW: At what point did you decide you could make art and be a professional in the field of medicine and were they always interests working together? CARL TANDATNICK: I was destined to become a doctor because many of my family members worked in medicine. My grandmother was an artist and throughout grade school I can remember painting and sketching. I was supposed to go to Oxford to medical school, but I went to Duke University instead. I also studied art at the University of North Carolina. I always thought of my core identity as an artist, and after two years of pre-med, I left school and went to the art school of the Art Institute of Chicago. I threw my whole heart and soul into art, yet I still had a feeling for medicine so I returned to Duke to finish pre-med and then went to med school in the Dominican Republic. In the Dominican Republic, I began looking at the beauty of microscopic elements and realized how gorgeous blood cells were. I later became more fascinated by red blood cells and started doing color xeroxes of them. As I did my studies in anesthesiology, I was learning about disease states and working on a daily basis with the human condition from the inside out. However, throughout my years in Chicago and in New York where I did my residency, I spent all of my free time in museums and my experiences at the Art Institute of Chicago were invaluable in terms of art history and really examining the paintings and drawings in their collection in great depth. 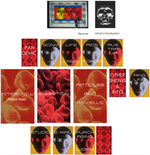 Three years ago, after having opened a private practice, I had enough financial resources to build a gigantic silkscreen press and build my studio and I made 90 large-scale photo-silkscreen on canvas paintings about blood cells and the AIDS virus. I have been doing blood imagery since the early 80s when I was first learning about it through histology and my studies of medicine. When the AIDS epidemic in the early 80s started to evolve and Carpose Sarcoma was coming on the scene. When the image of the AIDS virus was isolated, it became a natural thing to incorporate this image into my artwork. As my work progressed, it was just a natural combination of my knowledge of medicine and my work being so close in an operating room to mortality issues that this became the focus of my work. Medicine is another dimension that defines who I am as an artist, and the two are compatible because they enhance each other. LAS: How do you see art's role in affecting the outcome of AIDS? More specifically, how do you think your own art can affect this global problem? CT: Art is a very powerful medium for expressing ideas. There's an organization known as Visual AIDS in New York, where artists are committed to raising the public's awareness of the AIDS epidemic and I was associated with them by showing a video installation of an electron microscope image of the AIDS virus on the SONY Billboard in Times Square. This appeared twice an hour from seven to midnight. I felt that the message on the huge screen would move the public to more participation such as contributing money or educating themselves and others about the illness and its prevention. I hope that my own work will affect this problem by educating people around the world so that they see that this is a real entity, an actual thing, an organism that they can put a face onto. The electron microscope image of the virus is not just a concept in someone's imagination. but it’s a tangible entity that they can see. Hopefully, this will make the public sit up and realize that it truly exists and they must do everything possible to try and combat it and do what they can to contribute to the fight against AIDS. I believe the work crosses national boundaries and anyone around the world seeing the painting of the AIDS virus will understand the impact of the problem as a global epidemic. LAS: What influenced your visual imagery in your paintings? What is the political aspect of these works? What is the aesthetic aspect? CT: My two greatest artistic influences are Warhol and Rauschenberg and their technique is the one that I employ in my paintings. My visual imagery has also been influenced by my studies of medicine and histology, which is the study of microscopic cells and the microscopic make-up of various tissues. In the 20th century, we've seen the most explosive growth in scientific understanding and ever since the Industrial Revolution, we've been in a scientific renaissance. The entire 20th century has been defined by man's ability to utilize machines to explore and expand his horizons. Since an artist has to be of the moment of his own times, the scientific or technological aspects are guiding influences on my visual imagery. Never before in the history of humankind have we been able to see red blood cells which course through our bodies and gives life to us by carrying the oxygen. Therefore technology and electron microscopy have opened up entire new worlds of vision and since the artist’s responsibility is to demonstrate new visual images, as an artist of the 20th century, these new visual horizons are being appropriated for my work. I believe my work transcends politics because in the final analysis looking back at history, these will cease to be seen in a political light and more in a documentary way. There have been some political pieces, however. For instance, USAIDS which was shown at Artists Space in the AIDS Forum showed a ring of AIDS viruses in red around a central image of skulls in blue with a thin band of normal healthy blood cells in white and this simulated an American flag and this was my political message, crying out, so to speak, to the state of the AIDS epidemic in the U.S. In some ways, it’s an endeitment of the fact that the United States for a long time refused to recognize the extent of the epidemic and in many ways still continues to put less emphasis on the issue on a governmental and political level. Hopefully the message will be that this virus can affect anyone anywhere. Aesthetically, the colors are very bright images and I've caught some flack because some have thought my colors are too pop, but there's a freedom in imaging color that attracted me and for this reason I’ve done a lot of work with vibrant exciting colors. When I create these paintings, I have an incredible joy of manipulating color combinations and compositional patterns. The aesthetics of the piece are foremost and primary when I create a work and it has to stand up in its own right visually. LAS: Why do you feel it necessary to work so monumentally? Do you ever work in a more intimate format? CT: The monumental scale of the AIDS epidemic befits a monumental scale for the artwork. From a conceptual standpoint, I like showing a microscopic infinitesimally small thing on a grand monumental scale, so showing the AIDS virus or a blood cell, which is an electron microscope image twenty feet tall is just an interesting conceptual juxtaposition of size. In producing the large-scale silkscreen, I've waited all my life to have a studio to make these paintings. It was just a liberating feeling to create big work. I love Warhol's gigantic Mao painting and I love Picasso's Guernica and I just love huge paintings. I do work on a smaller more intimate scale and have created smaller pieces. In time, I do hope to do more smaller works. LAS: Why did you decide to do an installation? How did it feel to work more concretely? How do aesthetics play a part in the installation? CT: After receiving the Alternative Museum National Showcase Exhibition Award in 1993, which was an opportunity to have a solo show the following year, I felt that doing an installation would be the best way to use the space they provided. On a daily basis, when I go into work I sit in an operating room. Laparoscopic surgery has become the thing and during this type of surgery they turn all the lights out and the surgeons operate through the use of cameras and they look through TV Screens on both sides of the table at the internal organs and operate internally. So with the lights out and all the monitors lit up and the EKG and cardiac tracers are making their sounds with quiet all around, I felt that this was very beautiful and I wanted to show the beauty of this environment. I contacted thirty corporate sponsors. I got the IV bags from the companies that make the IV solutions and in my imagination an epiphany came to me of these black lights and these fluorescent IV bags and the patient on the table. I contacted the various companies for the equipment and I put together this room where the person entering has to go through a steel door and see this body on the table and I recorded surgery in progress and sound effect CDs and mixed this 26-minute soundtrack that plays in the background continuously throughout the day. I made these squiggly patterns with the IV tubing like a line drawing in space arching and coiling and the bags look like jewels. I want the viewer to go into this environment and hear the LIFE CRISIS sound playing in the background and see the chest rising and falling on the body which is under the drapes and juxtapose the beauty of this environment against the abstract crisis situation Then for a short period of time after coming out of the installation they may realize how precious life is. Putting the whole thing together was an opportunity to express my ideas and influence the viewer. LAS: When people experience the installation, do you think they might get turned off and walk away or is there something about it that seduces them? What has the overall response been? CT: I think the overall morbid curiosity, the visual beauty and the strangeness of it all seduces them. Some people were afraid to go into it They only looked through the big steel door inside, and some actually never walked in. Some walked in and ran out screaming. Many people spent time there and soaked up the environment. A lot of people went in there and understood that this was an abstraction of a crisis situation of a medical operating room or an intensive care unit or some otherworldly life/death event. The IV bags with antifreeze under the black light looked like emeralds floating in space and the bags with ultraviolet red florescent paint looked like rubies. But I believe the deeper message stayed with them. The overall response has been very favorable, and, in fact, a University of Virginia student saw it in New York and told the University about it and that's how I got to present it at the University. LAS: How do you manage to juggle both careers? Do you see them going hand in hand? CT: I manage to juggle both careers because I have to. I need to make my artwork and I always have and I need to practice medicine because it's been a part of me. I've put in many years studying and I get great satisfaction in the intellectual discipline of medicine and on a personal level of helping people and I want to continue it, but in my very core I am an artist. I see these careers going entirely hand in hand, because medicine is the mental framework in which I operate. It's the niche for my mind and my concepts of mortality and it forms the basis for my ideas and its symbiotic with my art. It also allows me to make a living and makes me financially independent enough where I can create my artwork in an uninhibited way. It enables me to do more with my work for purely conceptual and aesthetic reasons rather than financial reasons. LAS: Can you be just as serious about the two careers? CT: Well, I am just as serious about the two careers. I can be and I am and I will continue to be. At some point, though, I wish to slow down my practice of medicine and concentrate more fully on my artwork. However, I never want to be far from the source of my inspiration. Ultimately, though, I do want to pursue the art full-time and the medicine part-time. At the present time, I manage doing both careers well. LAS: What are your plans for future projects? CT: Eventually, I'd like to be more widely represented in museums and exhibitions like the Whitney Biennial, Documenta and the Venice Biennale. I'm going to do the SONY Billboard in Times Square next December 1st for A Day Without Art." I may be doing collaboration with another artist who has shown at the New Museum of Contemporary Art and another artist friend who recently showed at the Whitney has asked me to do a collaboration with him. There's also a possibility of an exhibition in Berlin upcoming. I'm also thinking about doing physiologic portraits which will be installational and will involve analyzing a person based on his physiological vital signs at one particular time and then documented through photography or canvas.